HomePiranha Goes Rudolstadt Festival - 10 acts you shouldn't miss! 10 acts you shouldn't miss! Rudolstadt Festival is one of the largest and most prestigious annual world music festivals in Germany and Europe. With more than 20 stages spread over the entire town and about 300 performances, the variety of the festival is simply overwhelming! This year it comes back and sets off for its journey between 6 - 9 July 2017. We did our homework - for there is lots of great things happening there once again this year - and gathered some musical acts and concert tips for you. Animated Afro-funk, hip-hopping grooves, high-speed guitar jams: Jupiter Bokondji’s music reflects his many experiences. 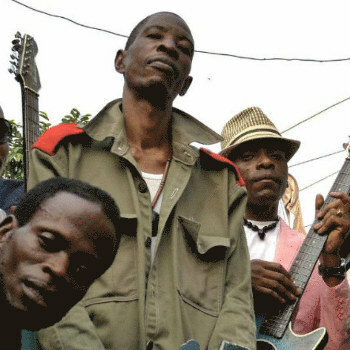 In 1990 his band Okwess International was founded - a group with many avant-garde artists such as Jean Goubald. We saw them live on stage as part of last year's WOMEX Official Selection and were amazed by their dynamic performance! Read more here. The band was founded in 2006 in Tamanrasset, South Africa, but it was only last year that their debut album was released. Their music combines "the funky grooves of West Africa with the more airy folk music in the Sahara - a convincing variety of rhythms and feelings". Read more here. Dr. Anthony Joseph is a British poet, author, musician and academic of Trinidad descent. All the works of the "leader of the black avant-garde in Great Britain" revolve around questions of culture and identity. While doing so, he embeds his spoken word performance into a pan-Caribbean music mix between Calypso, Soca and Afro-Funk. Read more here. Another one of the artists that performed as part of the WOMEX 2016 Official Selection - Trio Da Kali is definitely a group that can build a bridge from tradition to the future! Three young musicians from Mali with a strong family tree: Hawa Diabate, Mamadou Kouyate and Lassana Diabate. Read more here. Dona Onete was born in the State of Para in the north of Brazil and is one of the musicians that have managed to develop their own musical style: Carimbo chamegado - a mixture of the traditional music of her state with "some spice", as she says. Dona Onete was already 70, when a local brass band heard her and helped her to a late successful career. An unlikely but seductive success story. Read more here. For 20 years, the Argentinian pianist Gerardo Jerez Le Cam, together with the Romanian violinist Iacob Maciuca, has been walking on the bridge connecting his native tango with the music of the Balkans in a highly artistic way. After attending Classical:NEXT this year and seeing them as one of its Showcase Artists - we can surely say that this is a concert that should not be missed. Read more here. These three musicians are undoubtedly bringing to the stage the finest quality on the Cretan Lyra (Petrakis), Iranian Zarb (Chemirani) and a collection of Mediterranean instruments from Valencia (López). Traditions from Crete and from other Greek islands meet with those from Iran, Turkey, Armenia, Azerbaijan and Afghanistan. Read more here. The Krar Collective is a trio of musicians that create a hypnotic, unique sound through an electrified Krar, a traditional drum kebro, and expressive vocals that are inspired by the old repetitive rhythmic patterns of Ethiopian music. Read more here. Emicida is regarded as the most accurate and sharp-tongued rapper in Brazil. In his sound, he combines different styles of music that flourish in his country like - samba, funk, jazz and hip hop. We first saw him live at WOMEX 2015 in Budapest, and we can undoubtedly say that his music reached one of its main goals: to bring people together and unite them on the dance floor. Read more here. According to the prestigious American magazine Billboard, La Mambanegra, belongs to the five Colombian bands, which must be heard. They manage to combine effortless fun with Ragga, Jamaican rhythms and salsa in a way that makes the crowd go wild! Read more here.